Well hello loves! It’s Friday again- hooray! So even though this link-up hasn’t really taken off, I’m sticking with it. Feel free to join me if you like! This week I’ve got some serious new obsessions to share with you! Let’s get started. 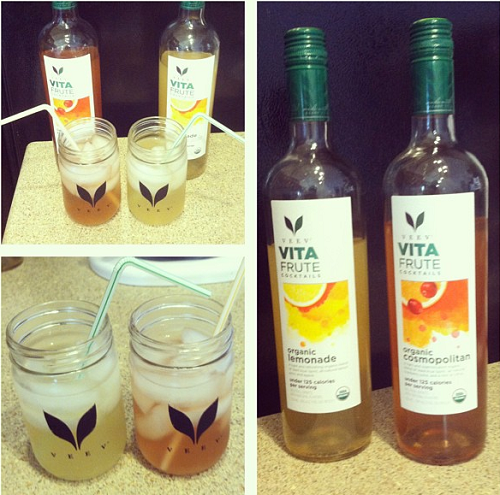 The fine people at Veev must have noticed that mamma likes to unwind after work because they sent me their new cocktails to try! I was excited to try their spiked lemonade and their cosmopolitan. Not only are these drinks great because they are premixed (translation- easy), but they are also low calorie at under 125 calories per serving! I have to say the cosmo was my favorite! I can’t wait to muddle some strawberries in the lemonade- talk about perfect poolside cocktail! YUM! Maybe I am the last person to find the Kate Spade blog, Behind the Curtain, but I just love it! 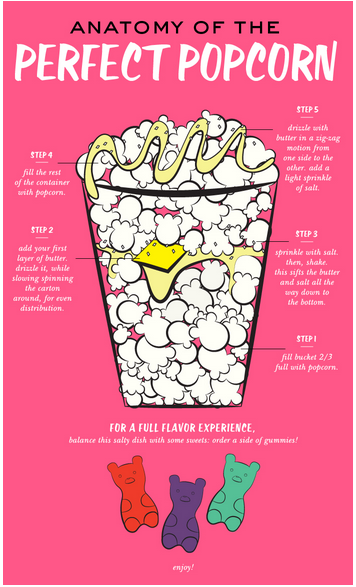 How cute is this graphic about the Anatomy of the Perfect Popcorn! Just life everything else that Kate Spade puts out, this blog is perfect! Holy cutest workout wear ever!!! I decided my reward for losing my first 20 pounds will be a new exercise wardrobe and in addition to the pile of Lululemon goodies I have my eye on, I am definitely adding these tops to my list! I love the Sweat Happy tank! I am absolutely obsessed with Lotus Salon and Spa in Costa Mesa! Let me rewind. 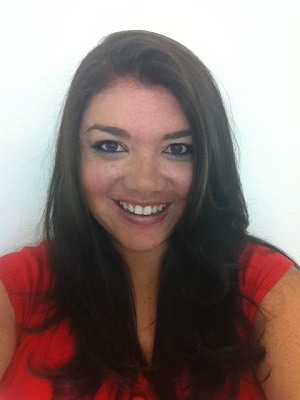 For years, my hair stylist has been my best friend, who happens to work at one of the top salons in Phoenix. The idea of finding someone I could trust with my mane here in Cali was a little scary. So a few months back I went to an event at the Lotus Salon and Spa with Lauren and it was my lucky night. I went home with quite a few products and services thanks to a raffle and silent auction! After my first visit, I knew I would be back. I’ve now seen two different stylists, Bernie and Natalie because of different gift certificates I won. Both of them are creative geniuses and so incredibly knowledgeable on top of being so incredibly sweet! I saw Natalie yesterday and she helped take me back to my natural color and gave me a gorgeous long layer cut! And Vanny the esthetician helped me totally change my skin. I’ve seen her 3 times and my skin is looking better than it did during years of dermatologist visits and thousands of dollars in skin care products. 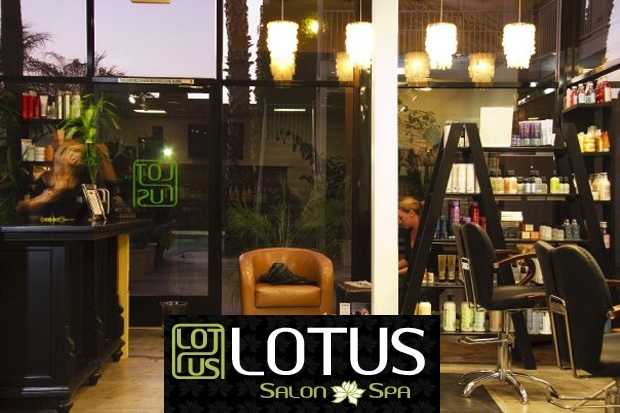 If you live in Orange County and you’re looking for a new stylist or skin care professional, check out Lotus Salon and Spa! So that’s it for this week! 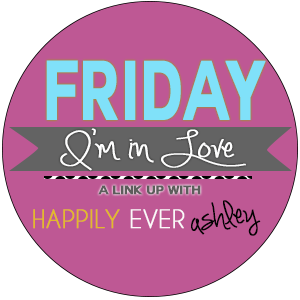 I’d just love for you to link up and share the things your loving this week. you look fantastic!!!! love it!!! Truly in love with your cute work outfits.